As an avid reader and learning junkie, I can’t think of a nicer gift than to receive a book. Just such a gift showed up in my mailbox during the holidays, and I was delighted to see that it had been written by my colleague Essie Escobedo, the Chief Executive Angel at Office Angels. 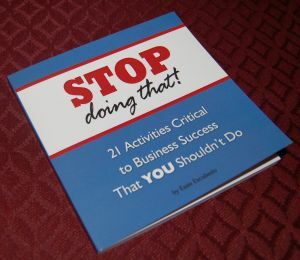 The book is called STOP doing that! 21 Activities Critical to Business Success That YOU Shouldn’t Do. At fewer than 100 pages, Essie words of wisdom smacked me right upside the head yesterday morning. I didn’t have so much of an “ah ha” moment, as I did an “oh $%*#” moment when I realized that out of 21 activities, I’m guilty of doing 15 of them. Ouch! Right then, I decided that I needed to change some things. How else can I expect my business to grow to the level I’ve been envisioning? But it is a funny thing about change. We commonly think that change of any significance takes a long time to make happen. I’ve come to agree with Tony Robbins that this is a myth. Start feeling enough pain and I guarantee you’ll change anything – instantly. Entrepreneurs largely think that they have to do it all themselves and often use lack of money to fund the necessary resources as the excuse. Been there. I’ve boot-strapped it like everyone else, but the problem is that there will NEVER be enough free resources available to help you get to where you need to go. You must invest in yourself and your business and guess what…you must delegate the things that you don’t do well and that pull you away from your core strengths. The fact is that you’ve got to spend money to get the professional assistance you need in order to create a thriving business. While I’m not going to share the entire list – because I want you to buy Essie’s book – I want to use activity #8 Creating Your Own Business Plan, as an example of what I resolved to change immediately. Yes, I have a sales and marketing plan, which probably puts me farther ahead than many small business owners, but an honest-to-goodness business plan that looks at all aspects of my business and considers today and the future of my company? Uh, a little lacking there. And I know exactly why. Not only am I too close to the situation and think all of my ideas and strategies are brilliant – come on, what business owner doesn’t? – but I’m not the most skilled at it. I am fully aware of the importance of having a clear and detailed roadmap but with so many opinions out there about how to do planning well, I become overwhelmed before I even begin. Convenient excuse, isn’t it? If you truly want to succeed, you must hire help! It really is that simple. I know. I did it yesterday when I hired a business advisor to help me get that plan in order. Now it’s your turn. Read Essie’s book. Determine what help you need. Commit to hiring someone immediately, do it, then come back to my blog and share your success story. By the way, I’ll be interviewing Essie about her book in an upcoming podcast on Entrepreneurial Mastery. I know you’ll want to tune in! On October 30th in Atlanta, I’ll be moderating a panel at the The Big2smb Social Media Conference produced by Dan Greenfield, President at LISTEN Interactive. The session is titled, “Leveraging Social Selling to Identify New Business Customers”. I’m really looking forward to attending the conference because I believe that the SMB (small/medium business) space is a grossly under served market. 46% said that companies try to sell to me versus talking to me. Dan reached out to me recently to ask me my thoughts on how enterprise companies and their sales and marketing teams could do a better job of reaching, connecting and selling to SMB’s. Dan: What do you see as the top challenge that enterprise companies face in reaching (marketing/selling to) today’s SMB market? Barb: Understanding what drives them, the challenges that they face, what literally keeps them awake at night. Most small business owners do not have huge budgets, so every decision that is made when selecting a product or service is critical to get right. For those enterprise companies selling to small business, I’d like to suggest that they consider hiring salespeople who either have the experience successfully selling to small companies or have been a small business owner themselves. Dan: How critical a role is social media playing in reaching the SMB market? How do you see that role changing in the future? Barb: Research confirms that 80% of the buying cycle begins without the initial engagement of a sales person. For that reason, every sales rep needs to have great online presence. Before the buyer takes a meeting with you, they will Google you, look you up on LinkedIn, Twitter and Facebook. Since LinkedIn is the B2B networking site, your professional profile should be 100% complete and provide compelling content and information about you and your company. Share value packed, relevant white papers, case studies, presentations, video or industry articles. As far as the role of social media going forward is concerned… InsideView recently reported that 92% of buyers do not respond to cold calls or cold emails. That means that your ability as a salesperson to create value in advance of sales opportunities becomes more important than ever. Social media gives you huge sales leverage when done right. Dan: What advice would you give sales teams in using social media to reach SMB prospects and opportunities? Barb: Use social networking tools like LinkedIn on a daily basis. If you hope to have a shot at new sales opportunities, your visibility matters. Next, ditch the pitch. Don’t use these tools to spit out sales spam. That only annoys people and harms you rather than helps you. Be relevant and share valuable content related to your industry and people will take notice. Finally, do your homework. The days of walking in blind asking questions you should already know the answers to are over! Leverage social media to learn about your prospect and their business before your first phone call or face-to-face meeting. SOCIAL SALES SURVEY – take this quick, 3-minute (I promise) survey to help us understand how salespeople are using social media. You will receive a copy of the results. Click here to complete the survey. Have You Turned on Your Financial Lightbulb? Hard to believe that I’ve had my own company for 9 years now. As I’ve been contemplating my future direction, I found my mind wandering back through the years reflecting on the good, bad and the ugly of being an entrepreneur. Clearly, the good outweighs any of the challenges or I wouldn’t still be doing it today, but boy oh boy, the mistakes that I’ve made. Are you paying attention to your numbers? No, I don’t mean your sales numbers, although those are very important. I mean, are you paying attention to things like cash flow and profitability? If you were like me, you don’t pay much attention to the financial segment of your company. You never learned about balance sheets and profit and loss statements. Financial statements rarely, if ever get produced. If there was enough money in the business checking account to pay the bills you are happy. Your accountant? You use him for taxes once per year. Sometimes you are shocked that you owe the IRS a lot of money. I certainly have a lot of business strengths, but people, accounting and finance are not two of them. As a result, I learned a lot of painful financial lessons over the years. These days, I do pay attention to the financial side of my company. Though I will never be a financial management wizard, I’ve discovered that minding your numbers is actually not hard once you understand the simple terms. All of us have blind spots when it comes to our businesses. For some, it might be sales or operations. In my case, its finances. For the last several years, I’ve committed myself to learning because even though I will never be naturally gifted in the finance department that is no excuse for not knowing what is going on. I’d like to introduce you to my coach and teacher Ruth King, who is the creator of the website, www.TurnOnMyFinancialLightbulb.com, small business self-help financial coaching. Take the quiz on the home page – I did. You can immediately see whether this course is for you. When you enter EV12578 in the promo code, you receive a $100 discount on the course tuition. This is a “Thank you” from me to you. It just might be the right thing to help you. I believe so passionately in the good work that Ruth is doing to help business owners improve their financial acumen that I signed on as a referral partner. As peeps from my network sign up for Ruth’s program, I’ll earn a little residual income also. Though I’m earning a little income from the referral, please know that Ruth really knows her stuff…I wouldn’t recommend her otherwise no matter what the referral fee! As business owners, it is easy to think that we can “get by” without ever needing the services of an attorney. And while there may be instances where you really can DIY, attorney and guest blogger, Traci Ellis also reminds of us that there are times when you definitely should seek legal counsel. Read on to hear what Traci has to stay. Turnabout is fair play, as the saying goes. Last month, I gave tips on when NOT to hire an attorney. So, when should you hire one? 1. Before You Launch Your Business. Before you form your business, to discuss which legal entity is right for you. It’s important that you understand the legal implications of choosing one entity over another. Also, you need to know which two business formations you should always avoid. A good small business attorney can discuss your choices and help you make the right choice–from the beginning. It is always cheaper to do it right up front, than to try to change it later. 2. Before You Sign Contracts (or Pay Someone a Large Sum of Money with NO Written Contract). I know a lot of business folks who get their contracts off of the internet or from a buddy and then “tailor” them to fit their needs. That’s one way to get contracts drafted. But, it’s not even close to being the best way to ensure that your business and legal interests are protected. No matter how many contracts you’ve seen or negotiated, just know that chances are slim that you know enough about contract law, best drafting practices, case law on certain issues, contract drafting nuances, etc., to adequately protect yourself and flush out the “gotchas” in a contract. If the business deal is worthy of doing, it’s worthy of spending the time and money to have it documented correctly. Additionally, you should absolutely, positively STOP downloading contracts off the internet and using them in your business! If you’ve been following my blog, then you know why. This is Why Google Can’t Be Your Small Business Attorney. 3. Big Disputes. When you are in a serious business dispute that has substantial business implications, don’t wait until you are sued or you’re ready to sue someone to consult with an attorney. Involving an attorney early on in a dispute can often head off bigger problems later. It will be infinitely more expensive to call in an attorney later on in the dispute when there’s lots of history than it is to get an attorney involved early on. 4. Major Transactions. When you are considering any major transaction such as buying or selling a company, do not, I repeat, do not begin these types of negotiations without legal counsel. You are asking for trouble. I once had a client that began negotiations with her largest competitor to sell her company to the competitor. By the time she called me, she had already turned over reams of confidential company documentation, including some important intellectual property information, without a non-disclosure agreement in place! Sometimes, it is easy to forget what seems like the obvious when you are intimately involved in the deal and when the “obvious” is not your expertise. 5. Trademarks. Unless you really know how to use the USPTO website to search for trademarks, it’s easy to miss a trademark. Also, you need to understand how trademark examiners think and what the case law says to understand why you can’t trademark a certain mark that is not the same as someone else’s. There are nuances there that are not obvious to the layperson. The risk is that you miss a registered mark (or fail to understand that someone with a similar mark can keep you from using your intended mark), start branding your company, and then get a “cease and desist” letter from someone on the other side of the country demanding that you stop using your mark. If it turns out the person is right, you will have to re-brand your company…and all the money spent on logos, graphics, business cards and any other business “paraphanalia” will be wasted. You may even have to change the website URL that you’ve undoubtedly worked so hard to get noticed in cyberspace. Author, speaker, business “therapist”, practicing attorney, and passionate promoter of women entrepreneurs, Traci Ellis is not your typical business lawyer. Known for telling it like it is, she likes to “keep it real” with new business owners while sharing practical wisdom and refreshing insight on legal and business issues related to starting, running and growing small businesses. Whether you are thinking about starting a business or have already stepped into the exciting world of entrepreneurship, Traci brings her nineteen years of practicing law and “baptism by fire” entrepreneurship experience to teach, humor, and challenge you, but most importantly to help you be a better business owner. Visit http://launchtherapy.com for more information. Hard to believe isn’t it? So much work goes into networking, securing appointments, making the presentations, writing the proposals and then somehow you never actually get around to asking for the sale. Even if you lack confidence or experience, closing doesn’t have to be painful or bewildering. Close from the beginning – not to be confused with the old fashioned hard sell; cutthroat approaches rarely works anymore. You are better off letting your prospect know exactly what you’re selling and how you believe what you offer can benefit their business. Sell value, integrity and, above all, relationship. Using this type of approach paves the way for a smoother close. Suggest specific terms. Rather than asking whether your prospect wants to buy, suggest a specific buying scenario and then ask if your customer agrees to it. For example, “We can start the coaching project on Tuesday for a retainer of $5,000. Would you like us to do that?” If your prospect is uncomfortable with any of the specifics, they will certainly let you know. Make sure you know enough about their needs before undertaking this approach. Otherwise, you risk sounding pushy. Well, there you have it. 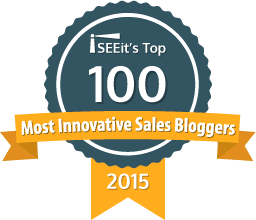 The Top 10 Sales Blunders and How You Can Avoid Them. I hope you’ve enjoyed this journey as much as I have. My passion is in helping YOU to attract more clients and close more sales, more often. There are four distinct phases to the buying cycle that you need to be aware of. Learn to recognize these phases when talking to your prospective clients and save yourself time and heartburn down the road. Phase I: Need – your prospect is aware that some sort of change is required either in themselves or in the company they work for; they may feel uneasy or possibly under pressure to quickly find a solution to the problem. Phase 2: Learn – knowing there is a need; your prospect sets out to research products or services that may potentially fix their problem. They are asking themselves who offers the best solution, so they will compare the offerings of several different companies during this phase. Phase 4: Value – in the value phase, your prospect is considering whether or not they will see the results that they’ve been promised. They might be wondering if they’ll really end up satisfied with the solution. They are weighing the value of the solution against the problem they need to solve and evaluating the risks involved with potentially making the wrong decision. Make sure you understand what phase of the buying process your customer is currently in. This will help you be more aware of the issues at stake and make you better prepared for selling your solution. In most things in life, a one-size-fits-all approach is rarely effective. This is especially true with selling. Approaching the sale the same way with every person just doesn’t work. Sure, you might be marginally successful with a few who have a similar style to yours, but you’ll be losing the chance to sell your product or service to about 75% of those others who are very different from you. As you meet prospective clients observe their pace – do they walk fast, talk fast and ask rapid fire questions? If the answer is “yes”, your best bet is to dispense with the pleasantries, cut to the chase, tell them what results they’ll get when they work with you, and then get out of their office. Others you’ll encounter will want detailed explanations and facts and figures to back up what you are offering, to be reassured that the buying risk they are taking won’t leave them twisting in the wind. To get started you’ve got to know yourself first. Assess your current sales strengths and capabilities. Get to know what you’re really good at and definitely get to know where you have challenges in the sales process. What comes next is learning about the personality styles of other people and what works for them in the sales process. 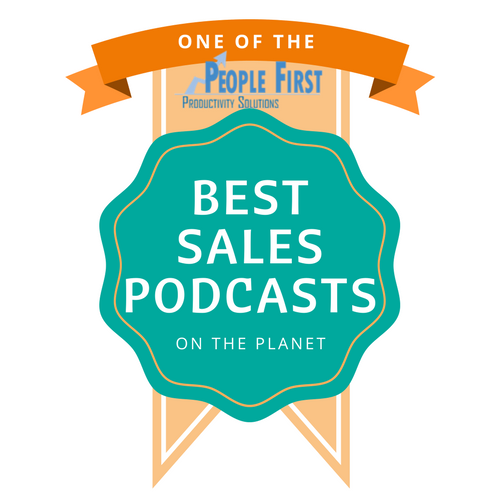 An important tool that you can use is the Everything DiSC Sales Profile to help you understand exactly where you excel and where you will need help. And more importantly, you will learn exactly what you need to do adapt your communication and pace in order to better connect with your prospect. When you understand how to meet people where they are and give them what they need during their buying process, your sales success will definitely soar! Once you’ve secured the appointment, the real work begins. You must decide what your objective for your meeting – whether it’s face to face or on the telephone – actually is and then create questions that lead the conversation to the destination you have in mind. I cannot stress strongly enough how important it is for you to PLAN for your meeting BEFORE walking in the door or calling them on the phone. Shooting from hip gets your nowhere, so if you are serious about closing sales, you need to do your homework. The first thing you need to do is determine your top 1-2 objectives for your sales meeting. It might be to generate enough interest to secure another meeting or get the purchasing commitment right on the spot. Whatever your goal, you must be very clear what outcome you expect to achieve when you sit down to meet. To keep your meeting on point and focused on your objectives, I recommend that you sit down and plan at least 10 questions that you will ask during that meeting. Think about how you can create them in two ways, just in case the answer to your first question falls flat. For example, if you ask: “How was your most recent quarterly sales performance?” and they say “fine”, you need to be prepared to ask the question another way in order to get more information. Frame your questions using “how” and “what”. Open ended questions tend to elicit answers that give you more than a simple “yes” or “no”. Preparing questions ahead of time keeps your conversation focused and flowing, and you are far more likely to listen to the answers and learn what you need, when you have considered your questions in advance.